At the 2018 Montreal Manufacturing Technology Show (MMTS), Mazak Corporation will show its automation and machine tool solutions in action, including a simulation of advanced robot machining techniques and live demonstrations on the VC-500A/5X Vertical Machining Center equipped with the optional 15,000-rpm spindle and 60-tool magazine. Mazak will be co-located with distributor A.W. Miller Technical Sales Inc. in booth #136 for the event, which takes place at Montreal’s Place Bonaventure on May 14–16. The Kentucky-built VC-500A/5X comes standard equipped with a robust, high- performance 12,000-rpm spindle that delivers exceptional metal removal capabilities in all common materials, including steel, aluminum, and cast iron. Optional spindle speeds of 15,000 and 20,000 rpm and tool magazine capacities of up to 60 tools are available to address a variety of part-production requirements, while its trunnion-style rotary/tilt table allows for highly accurate and cost-effective full 5-axis machining. 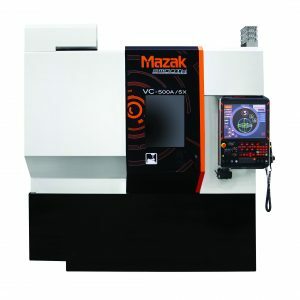 Mazak’s Mazatrol SmoothX CNC on the VC-500A/5X makes it easy to generate programs for highly complex parts production. It has several advanced functions that allow it to ensure the shortest possible machining cycle times, especially in fine increment programs for simultaneous 5-axis operations and free-form die and mold machining. These functions include high gain feed forward control, fast rotary axis speeds, variable acceleration control and intelligent pocket milling. The company also plans to demonstrate its articulated robot solutions on a simulated Mazak lathe. Mazak Automation Systems offers a full range of pre-engineered and custom automation solutions, including everything from gantry loaders and bar feeders to Palletech and the Mazatec Smart Manufacturing System (SMS). Primarily a customized type of product, articulated robots can handle part transfers and peripheral operations in addition to simplifying the challenges associated with heavy or awkwardly shaped parts. Whether a manufacturer needs a simple two-joint robot or a complex seven-joint robot, Mazak strives to offer a range of options to ensure customers can obtain increased throughput and better part quality no matter their production needs.